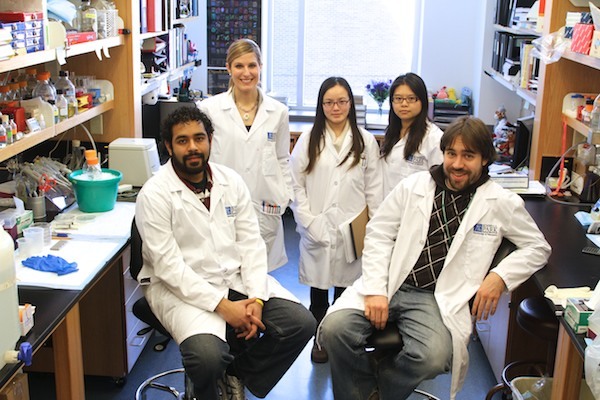 The Experimental Therapeutics Track offers graduate students the opportunity to conduct basic and translational research in the areas of cancer biology, drug development, and innovative cancer treatment design. Individuals with a background in chemistry, biochemistry, cell biology, molecular biology, pharmacology, and/or bioinformatics are encouraged to apply. Some prior research experience is desirable but not required. Rb1 and Trp53 cooperate to suppress prostate cancer lineage plasticity, metastasis, and antiandrogen resistance. Ku SY, Rosario S, Wang Y, Mu P, Seshadri M, Goodrich ZW, Goodrich MM, Labbé DP, Gomez EC, Wang J, Long HW, Xu B, Brown M, Loda M, Sawyers CL, Ellis L, Goodrich DW. MicroRNA-141 suppresses prostate cancer stem cells and metastasis by targeting a cohort of pro-metastasis genes. Liu C, Liu R, Zhang D, Deng Q, Liu B, Chao HP, Rycaj K, Takata Y, Lin K, Lu Y, Zhong Y, Krolewski J, Shen J, Tang DG. Nat Commun. 2017 Jan 23;8:14270. ET Seminar: Trainees participate in a weekly, mentored seminar series to promote excellence in scientific communication. After each presentation, trainees receive oral and written critiques from faculty and students. Current Topics in Cancer Pharmacology: Trainees develop critical thinking skills by participating in a class in which contemporary papers in cancer pharmacology are discussed and critiqued. Lunch with external speakers: The ET Track organizes several lectures per year delivered by prominent, external scientists. Trainees have the opportunity to meet with these speakers to discuss science, get career advice, and promote collaborations and networking. Dave Lecture: Students in the ET Track select a highly impactful scientist to deliver the annual Dave Memorial Lecture. Students coordinate and organize all aspects of the guest’s visit. Recent Dave Memorial Lecturers include Robert A Weinberg, PhD (2012); Carol Prives, PhD (2013); Charles Sawyers, MD (2014); and Steven Fesik, PhD (2015).